When looking for a better method to manage your iPhone/Android phone data, you might have noticed that AnyTrans is usually highly recommended. What is AnyTrans? It is an all-in-one iOS & Android data transfer tool that enables you to view and edit iPhone/Android phone contents on computer, extract iPhone backup files, or transfer data to new iPhone/Android phone etc. Whatever you need, AnyTrans can help you make it. Then how to get AnyTrans to manage your iPhone/Android content? Is AnyTrans free to use? If so, how can you download free AnyTrans? If not, can you get the AnyTrans free version to have a try? In the post, you’ll find all the answers. AnyTrans is one comprehensive iOS & Android data management tool, which can help you take complete control of your iPhone/Android data with ease. It lets you manage and transfer contacts, messages, music, ringtones, photos, videos, and calendar etc., always lets you put the important data in the right place. 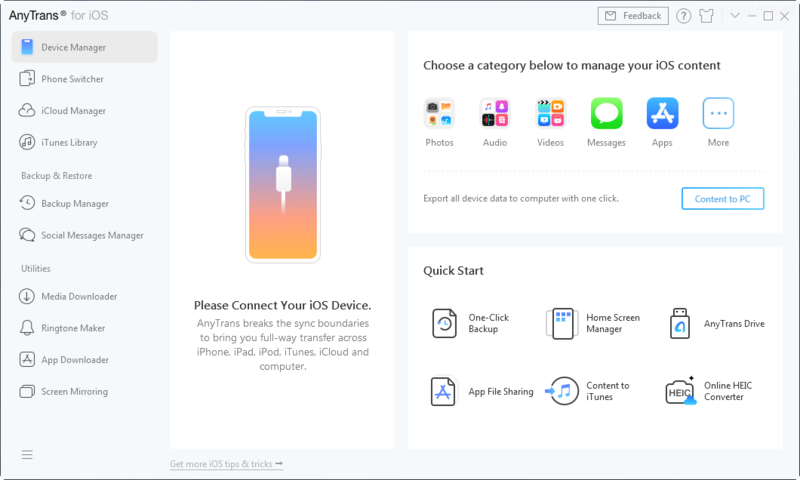 As one all-sided iOS data management tool, AnyTrans for iOS can help you manage your iOS data between iOS devices, iOS device & computer, iOS device & iTunes, iOS device & iCloud as well as contents in iTunes and iCloud backups. Besides that, it also offers you Android to iOS transfer and online video/music download. 1. iTunes only lets you sync data from iTunes to iPhone, iPad, iPod, while AnyTrans for iOS not just supports iTunes to iDevice transfer, but from iDevice to iDevice, from iDevice to computer/iTunes and vice versa, from iDevice to iCloud, and from Android to iDevice. 2. AnyTrans for iOS supports all kinds of data types, including photos, music, ringtones,videos, podcasts,contacts, messages, calendar etc. And now in the iTunes 12.7, there are no Tones and Apps. 3. No data erase. AnyTrans for iOS will not erase any existing data on device during or after the transfer, while iTunes will erase the existed device data. 4. AnyTrans for iOS also lets you view iTunes and iCloud backups and lets you download the backup files to computer. 5. Easy to operate. The interface is friendly enough compared to iTunes, and also offers the step-by-step guide. You can easily put your data in the right place as you want even if you have no prior knowledge of data transfer. 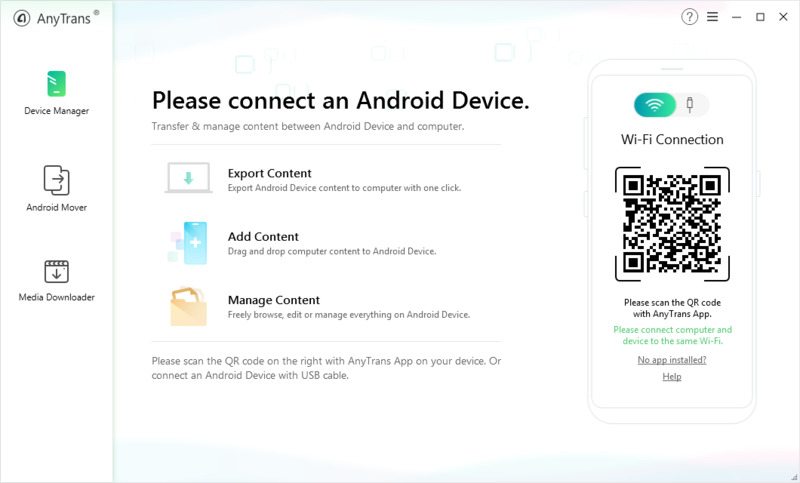 AnyTrans for Android lets you manage your Android contents between Android devices, Android device & computer as well as moving iOS data to Android. Also allow you to download online videos/songs to your Android phone directly. All files are organized by categories and you can easily find and transfer the data you need. Is AnyTrans free? In fact, it is free to download , but, if you want to use all the functions of AnyTrans without limitation, you need to pay for it. However, you may feel confused about AnyTrans because it’s totally new to you, and don’t know whether it is worth it. Well, the good news is that it offers a free trial, which lets you transfer 50 items per day in the first 7 days (AnyTrans for iOS) & transfer 30 items per day in the first 5 days (AnyTrans for Android). You can free download AnyTrans, try it and then make your decision. For the differences between AnyTrans free version and the paid one, please move to the next part now. You can enjoy the AnyTrans full version if you have purchased the license code. Or you can firstly have a try on the AnyTrans free version and then decide whether to buy it. But pay attention that compared with the full version, there are inevitably some AnyTrans free trial limitations. And here comes a comparison between AnyTrans free and paid version. No matter AnyTrans free version or the paid one, you will enjoy the lightning fast transfer speed, for example, 100 pictures in only 3.4 seconds from device to computer. Besides the powerful functions, Norton – the world-class certification authority has certified it to 100% guarantee that AnyTrans is free from virus. McAfee SECURE also protects the online orders and payment. All the international certifications that AnyTrans has received show that AnyTrans is safe for you to download and purchase. 24/7/365 Customer Service. Any problem you meet when using AnyTrans will get the valid help. 60 Days Money Back Guarantee. You’ll get the 100% unconditional full refund if you are not satisfied with AnyTrans within 60 days. Free Life-time Upgrade. You can update AnyTrans freely when there is a new version. Time-limited E-book offer. For iOS users, you will get a top-valued E-book, which covers 100+ useful tips & tricks to help you make the best use of your iPhone, iTunes and iCloud. If you want to get AnyTrans free trial, please click Download Now button to download AnyTrans on your Mac or PC. If you want to buy AnyTrans to enjoy all the functions completely, please click Get It Now button. Now you have known everything about AnyTrans free trial. Get the AnyTrans free version to have a try and directly buy the AnyTrans full version are both warmly welcomed. If you have still any question about this guide or AnyTrans, please feel free to contact us via email or leave a comment and you’ll receive a reply soon.